A large and strenghtening upper right / high pressure system dominates much of Europe while deep trough with a deep cyclone moves across Scandinavia. Upper low over Iberian peninsula finally weakens with a frontal zone pushed into SW Iberia. Diffuse frontal zone across S Balkan serves as another focus for convective activity in the afternoon. A SLGT risk has been issued for parts of S Balkan peninsula into NNW Turkey with threat for isolated severe storms, capable of producing severe winds, heavy rainfall and large hail. A SLGT risk has been issued for S Portugal and SW Spain with threat for severe storms along the cold front, capable of producing severe winds, large hail and torrential rainfall. TSTM risk areas have been placed across W Iberia and the Bay of Biscay with threat for scattered storms, some of them could produce graupel showers and heavy rainfall. TSTM risk areas have been placed across Alps, central Italy and S Turkey where some isolated diurnal driven storms are possible. 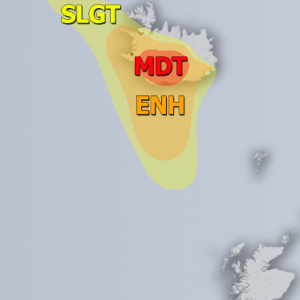 A MDT risk has been issued for N-CNTRL Norway, Norwegian sea and extreme NNW Sweden with threat for severe winds, locally in excess of 130 km/h. ENH/SLGT risk areas have been issued for areas surrounding the MDT risk area where severe winds in excess of 110 km/h are possible.